Okay, let’s rock. Not you dad! I’m talking about rocking toys for toddlers. 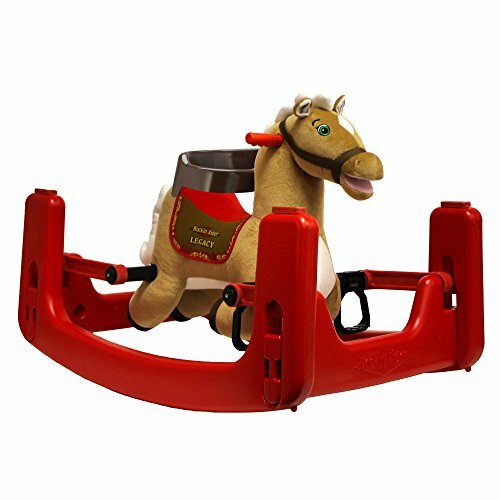 The traditional rocking horse is still alive and well as a toy choice, but in today’s world you have many more options to choose from. 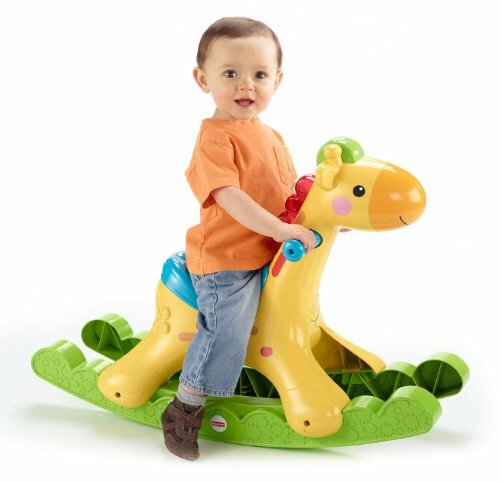 Giraffes, crocodiles, ponies, and even pink elephant rockers are available to keep the toddler in motion. There are suitable and colorful rockers available for any age toddler, from 6 months to 3 years. Rockers for babies are different than those for toddlers of 1-3 years. They are more like a safety chair that the baby can sit in and be rocked mostly by the parent. They are brightly colored and usually have a toy rail on the front for visual and touch. There are also rockers on the market that have wheels and can double as a stroller. Traditional rockers for 1-3 year olds are more activity toys that the kids can mount themselves from the side. These rockers are great for exercise and role play. They become the go to toy for most kids and can be used for years because of their versatility and your child’s imagination. 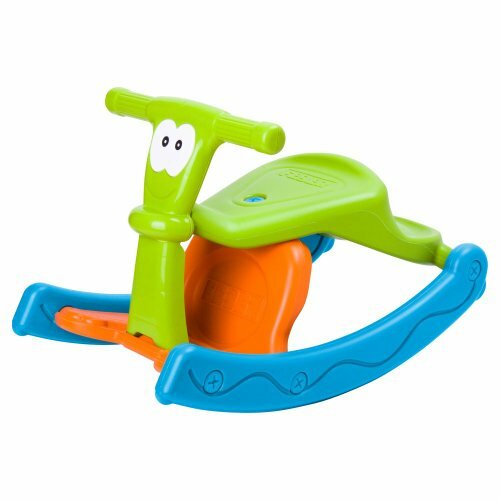 Great for improving grip, arm strength and balance, a rocking toy should be included in your toddlers collection. Designed for ages 1-3 years, this rocking giraffe responds to your child with lights, sounds and phrases. The mane lights up with 4 colorful dancing lights. This toy encourages activity and motion, the more the child rocks the more they are rewarded with lights, music and fun phrases. Climbing on and off the rocker develops balance and coordination. 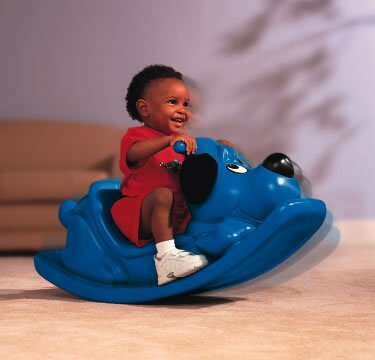 Recommended for 1-3 years this adorable puppy is fun, simple and safe. It has a high back seat, easy grip handles and textured seat and foot areas to reduce slipping. The soft fabric ears, cute nose and large puppy eyes give it a personality all its own. This is a rocker that is an infant seat that converts to a toddler rocker. In infant mode the baby is soothed with calming vibrations or mom’s gentle rocking of the seat. Toys are mounted to the toy bar and face downward towards baby for visual stimulation with bright colors and patterns. As your child grows it becomes a toddler rocking chair. 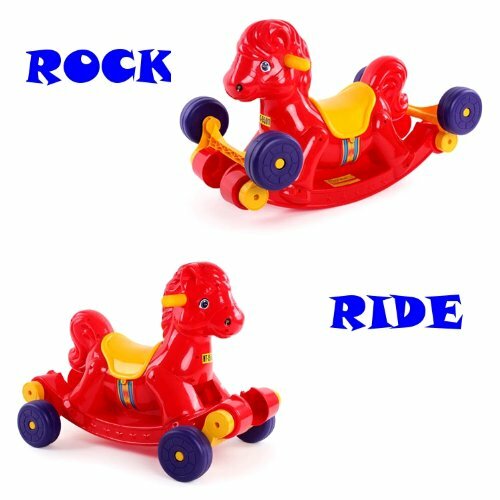 This multi-purpose rocker is one stop shopping and grows with your child from a bouncer, to a rocker, to a spring horse. Can be used by the same child from the time they are 9 months until they are 3 years old. Press the ears to hear the song “I’m a little pony” and 6 talking phrases and sound effects. Talks and sings with a synchronized moving mouth. Converts in minutes from rocker to spring horse without tools. It has a soft huggable plush covering with a detailed saddle and embroidered eyes. This purchase today will last for years as your child grows into its additional modes. Used as a 9 month old baby right up to a 50 pound child. Good long term value. 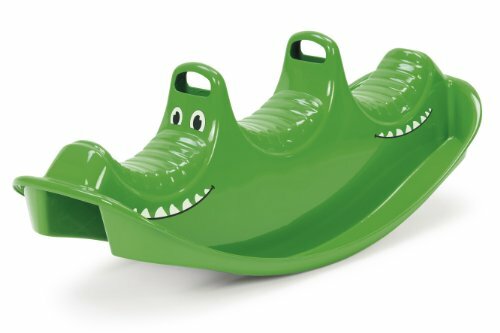 This crocodile rocker is a party in itself and can accommodate up to 3 kids and 150 pounds at a time. There is no assembly required and can be used inside and out. Recommended for 18 months to 4 year olds. This crocker rocker will provide hours of fun and is built to last. 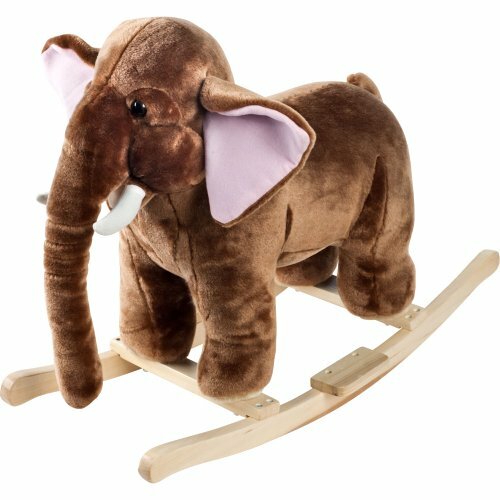 For ages 3-7 this plush elephant/mammoth can handle up to about 80 pounds. Fuzzy and friendly, it has real life sounds and is hand-crafted with a hardwood core, and stands on a sturdy wood foundation for safe use. A great addition to your child’s room it is a fun way for them to exercise. The real life sounds and action encourage imaginative role play. Sit or rock. Children will love the combo chair/rocker featuring a comfortable chair and a teeter totter. It is weather and fade resistant and can be used indoor and out. Easy to assemble no tools required. Ideal for children between 1 and 3 years. When not being used as a rocker it converts easily into a colorful chair for sitting or reading time. Light weight so that it can be moved and maneuvered easily by children. Dual use; rocking horse without wheels or baby stroller with wheels. 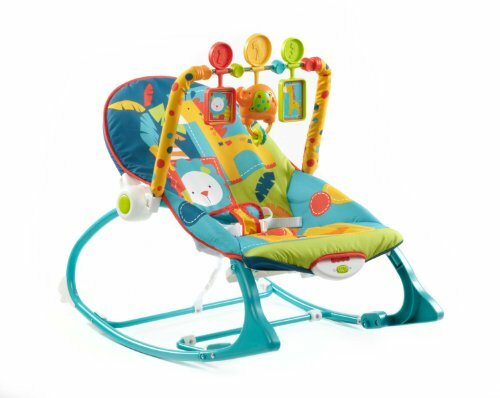 Bright color with vivid design and sturdy construction is suitable for 6 months and up with parental supervision. 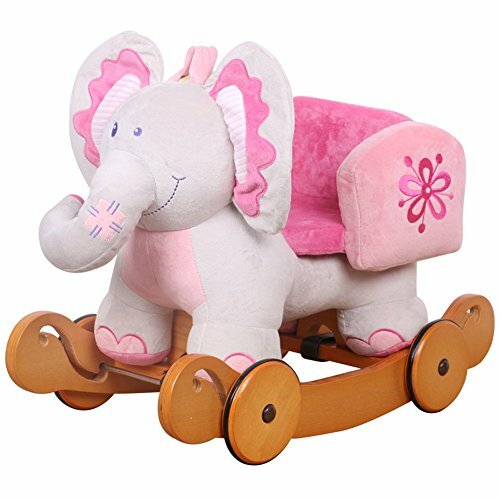 It has a comfortable and spacious cotton plush seat and holds a weight of up to 130 lbs. 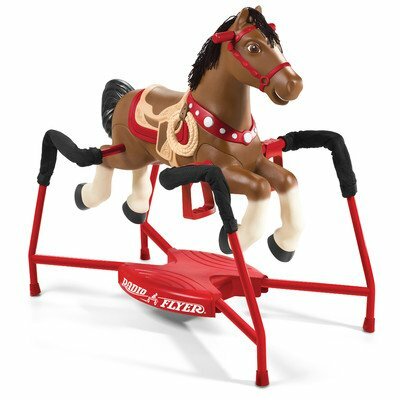 Easy to convert from a rocking horse to a ride on pony by flipping the wheels. For 3 years and up the traditional design and simple structure will make this toy horse become your kids favorite treasure. Good value for this 2 in 1 toy.